On October 19, 1781, British General Charles Cornwallis surrendered his army of some 8,000 men to General George Washington at Yorktown, giving up any chance of winning the Revolutionary War. Cornwallis had marched his army into the Virginia port town earlier that summer expecting to meet British ships sent from New York. The ships never arrived. 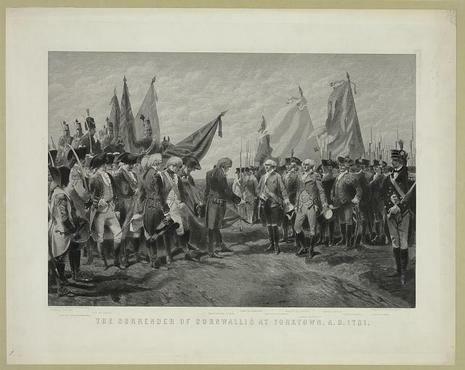 In early October, approximately 17,000 American and French troops led by Generals George Washington and Jean-Baptiste Rochambeau, respectively, surrounded British-occupied Yorktown. Off the coast, French Admiral François de Grasse strategically positioned his naval fleet to control access to the town via the Chesapeake Bay and the York River. 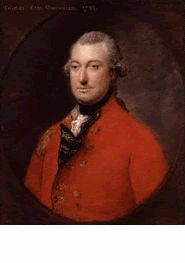 Charles Cornwallis, 1st Marquess Cornwallis, KG (31 December 1738 – 5 October, 1805) was a British army officer and colonial administrator. In the United States and Britain, he is best remembered as one of the leading generals in the American War of Independence. His 1781 surrender to a combined American-French force at the Siege of Yorktown is often incorrectly considered the end of the war; in fact, it continued for a further two years. Despite this defeat, he retained the confidence of successive British governments and continued to enjoy an active career. In India, where he served two terms as governor general, he is remembered for promulgating the Permanent Settlement. As Lord Lieutenant of Ireland, he argued for Catholic emancipation and oversaw the response to the 1798 Irish Rebellion and a French invasion of Ireland.